Gedera (Sheepfield) Modern Gedera was founded in Ottoman Palestine during Channukah, 1884 by Jewish emigrants from Tsarist Russia who left that country in response both to Tsar Alexander III's anti-semitic May Laws and to severe pogroms that broke out between 1881 and 1884. The Jews who settled Gedera were followers of the Bilu movement1,2, the aim of which was to establish agricultural settlements in Palestine. The name of Bilu is derived from a reference in Isaiah (2:5): "House of Jacob, let us go up". Two bonfires were lit to symbolize the lighting of the second Channukah candle and to celebrate the founding of the Gedera moshava. Benjamin and Mina Fuchs built the first stone house in 1888. This house became a Bnai Brith meeting house. The largest public building, built in 1912, is the Yeshuron synagogue. 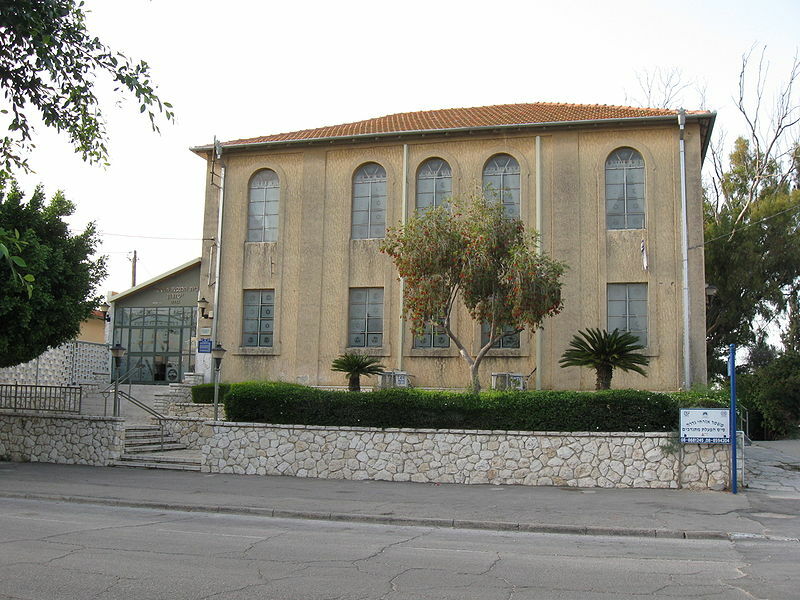 The first school was located, in 1896, in the synagogue; some time later, the school was relocated to a new structure built in the synagogue's yard. Still later, this school was converted to a meeting place, Beit Halkar, for local farmers. Its replacement school was housed in the ground floor of the town's water tower; the top of the tower served to store water and as a watchtower. The only building of those built by the Biluim that still survives is the Sverdlov family residence — the Sverdlov Shack — that had no running water or electricity. The bell that is now in front of the "shack", was used to call the town residence for meetings or emergencies. Beit Mintz, 'the House of Mintz', was built by Dr. Moshe Mintz, who was one of the Biluim. Dr. Mintz lived in one of the building's wings; another part of the house was used as a communal hall for Gedera residents. Since Dr. Mintz' death in 1930, the building has been used for a variety of purposes: kindergarten, cinema, public library and, during the War of Independence, military hospital. Before the era of the internal combustion engine, settlers needed a stable for draft animals. In 1885, a large hole (20m x 4m x 2m) was dug, a roof was added, and a stable was created. As more people settled in Gedera, the stable was partially converted to a bachelors' residence — Bor HaBilu'im. Yemenite immigrants settled in Gedera in 1912. With the start of the British Mandate Gedera, with its mild climate, became a popular resort. By the end of World War II, Gedera had grown to become a cosmopolitan town with residents who emigrated from countries around the world, among which were Poland, Romania, Yemen, India, Egypt, Iraq, and Iran. The 1950's saw the establishment of a Gedera neighborhood called Oriel (light of God). This section of the town is specially designed to promote the independence of the visually impaired, who work in a sheltered workshop. Biblical Gedera was located in the Kingdom of Judah, believed to be connected to Khirbet Judraya, south of Bayt Nattif 3 (the latter is twenty kilometers southwest of Jerusalem). Modern Gedera is located at the southern end of central Israel, eight miles (13 km) south of Rehovot. It is built on seven hills that are part of the Judaean foothills (Shfela)4, a region of many biblical battles; the wars against the Romans (e.g., the Bar Kochba Revolt of the second century, CE) were also fought in the Shfela. There is an archaeological mound — Tel Qatra — just to the north of Gedera that is identified with Kedron; the Seleucids fortified the latter against the Hasmonaeans5. Evidence indicates that Tel Qatra has been continuously occupied from the Bronze Age to the early Islamic period. The Arab village of Qatra occupied this site until 1948. The Qatraian Arabs once owned the land that the Jewish immigrants later purchased and on which they would create their settlement. This land may have been lost because the Arabs incurred too much debt; however, they continued to work the land as tenant farmers and considered the land as theirs. The arrival of the new land owners intruded into this view. Resentment led to much friction and violence. The Arab population left, with the encouragement of the Haganah, on 17 May 1948.